Hydro-Excavation is a process high pressure water is used to loosen soil, rocks, clay, gravel and other earth material while it is contiually "sucked up" into a debris tank for later disposal. As early as 1960 catch basin cleaners were adapted for hydro-excavation but the technology was crude as are most new ideas in their infancy. Many advancements in the technology for Hydro-Excavation were adapted and refined from industrial scale projects in the Northern Canadian oil and gas sector. Because of the cold climate and difficult working conditions "daylighting" buried lines with high pressure hot water and removing the debris by suction was proving and indispensable tool in the field. In the decades of 70s and 80s, modified vacuum trucks and sewer cleaners were adapted for use as suction excavators by the 90s there was a commercial demand for hydro-excavation machines for industrial, municipal and commercial use, but it wasn't until the new millennium that hydro-excavation was widely used and demanded by top contractors across Canada and the United States. The increasing demand for non-destructive digging and necessary improvements in the field of worker safety are the driving forces behind the growth of the vacuum excavation sector. The prevailing opinion is that in most cases a yard for yard excavating comparison between a Hydro-Excavator and a conventional bucket machine generally favors the conventional method on cost of dirt removal alone. However, it is important to note that the actual removing of the dirt is only a small part of the complete job. 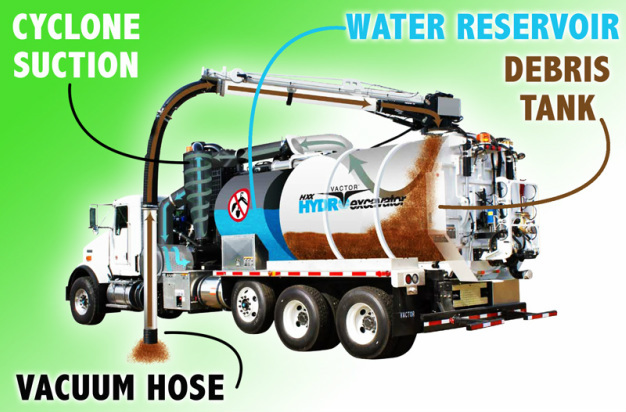 We already know the cost benefits that favour the Hydrovac method due to its reduced risk for possible damage to underground utilities, worker safety and liability issues, but many people are surprised to find that often the vacuum excavating method actually works out to be less cost than the conventional method. Below are the factors to consider, when for example, attempting to uncover a utility suspected to be 2 metres underground. Machine digging not feasible due to unknown specific location of utility. Hand Digging around utilities very time consuming. Larger area is disrupted due to need for sloped sides of a holes as workers are inside the hole not above it. More time required to restore the site to its original condition. Safe removal of earth by water, air and vacuum pressure. Fast removal minimizing disruption to area. Direct path to utility excavated and workers kept above ground. Ontario Sewer & Watermain Construction Assoc.